The conclusion of Week 2 called for a 6 mile long run. I wanted to treat myself to a little excitement, so I ran a local 10K on Saturday as my long run. The course was an out-and-back on pavement–so not my favorite kind of race, but the sun was shining and there were farm fresh strawberries at the finish, so who can really complain? I had a hard time zoning out and enjoying the run–I think because I was so aware of where exactly I was and how much was left the entire duration of the race. Yesterday, I started Week 3 with a 3 mile trail run. Once again, the weather was pristine. My legs were feeling like lead after Saturday’s 10K, followed by marshaling commencement at the university and then walking home. Luckily, I had our newest family member to keep me company. That’s right–we adopted a dog! Long story short, a fellow running mama is relocating with her family to a land far away and wanted to re-home her sweet trail-loving doggy. I feel very fortunate that we are able to welcome Lizzie into our family. 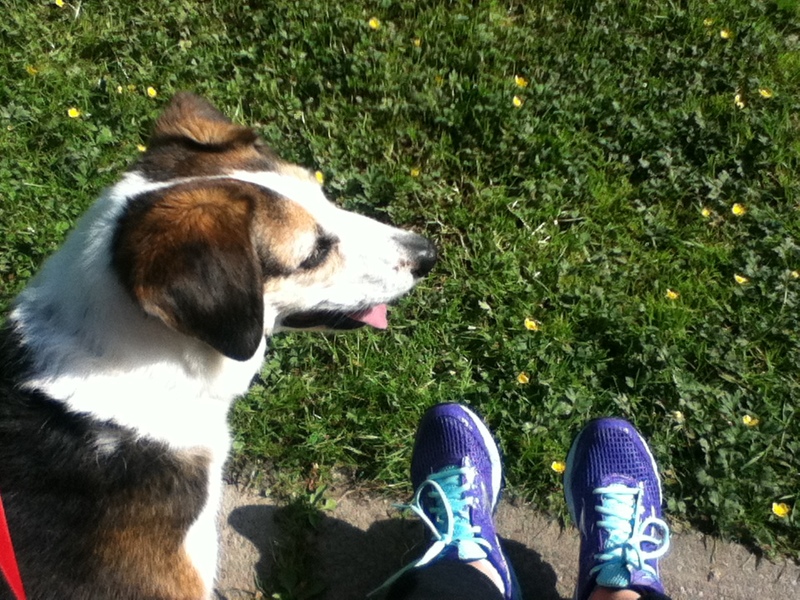 Lizzie relaxes in the sunshine after our trail run yesterday. My body is starting to feel like I am training for a race. With that comes the challenge of getting out the door and going for the prescribed run. Week 3 is all about finding a mindful middle and building a solid training base (according to my Bible). Excellent performance doesn’t come from intense arousal/excitement or non-existence arousal/excitement–Peak performance is derived from a mindful middle. It’s a balanced place of being grounded and certain in your goals, but not so swept away with anticipation that you bust out of the gate full speed. It’s a place of tempering negativity but also embracing a realistic appraisal of the activity to come. This practiced perspective surfaces through the development of a solid training base. The marathon will be a peak performance kind of day; an activity which demands a wholly embodied mindful middle. I have another run this afternoon, and although my legs are feeling a bit heavy and I’d like to sit out in the sun and drink beer, it doesn’t matter. First I need to honor myself and this practice by adding another drop to the jug. Then I can come home and relish my runner’s high. Your new puppy (I call them that from when they’re born until they are WAY-OLD like my Phoebe) is adorable! Have you ever had a dog before? How is the transition going for the two of you? Oh, my! What a great addition to your life!